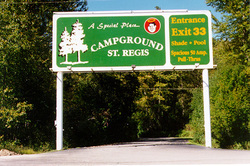 'A special place,' Campground St. Regis is a Good Sam Park in western Montana, rated by Wheeler's as a five-star park. We are surrounded by mountains in a wooded setting, with many shady sites. We have 75-foot-plus pull-thrus, 47 RV sites, and 28 tent sites. All sites have water, electricity, picnic tables, and fire rings. Full-hookup sites have 50-amp service, and 50, 30, and 20 amps are on other sites in the park. A laundry, propane and dump station are available. We offer group rates. You will enjoy our really clean restrooms and showers, heated swimming pool, game room, western gift store, and mini market. In town or minutes away are activities for the whole family ranging from golfing (two courses), fishing, whitewater rafting, horseback riding, and gambling and a choice of restaurants. St. Regis is the western gateway to the National Bison Range, Flathead Lake and Glacier National Park. A Good Sam Park, AAA Approved, and do KOA discout, and veteran discount. Directions: Campground St. Regis is located in St. Regis, Montana. From I-90, take St. Regis Exit 33: Turn left (west) at flashing red stop light; go 3/4 mile and turn left on Little Joe Road. Go 1/2 mile and turn right on Frontage Road. Proceed 1/2 mile to the camp entrance.